A message of light and love united the Lakeland community on Oct. 28 during a service of unity and remembrance at Temple Emanuel. Mike Scolnick, former Vice President of Temple Emanuel, wipes away tears during the service on the front lawn of Temple Emanuel on Oct. 28, 2018. The service was in response to the deaths of 11 at Tree of Life synagogue in Pittsburgh, PA. on Saturday, Oct. 27. 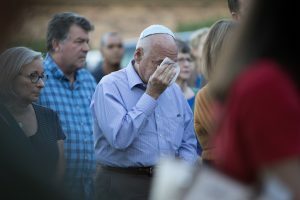 According to The New York Times, this event has been described as one of the deadliest attacks against the Jewish community in the United States. Florida Southern freshmen Gabby Araguiz and Melina Ramirez attended the event after being notified by an email sent out to all students from President Anne Kerr at 4:15 p.m.
“I just feel a really strong connection to my community and we prayed here [Temple Emanuel] about a month ago for the high holidays,” Ramirez said. Araguiz stated that her former rabbi used to attend Tree of Life synagogue. “I feel like you need to show that you care and this matters and this shouldn’t be happening,”Araguiz said. Dr. Catherine Eskin, advisor for FSC Hillel, was in attendance. Temple Emanuel Rabbi David Goldstein spoke to reporters before the service that he was disheartened but not surprised that an incident like this occurred. 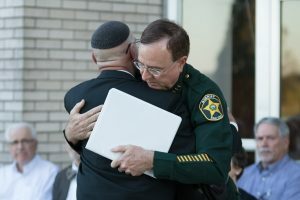 Rabbi David Goldstein and Sheriff Grady Judd embrace during the service at Temple Emanuel on Oct. 28, 2018. He went on to say that his officers will do whatever it takes to protect the citizens of Polk County and bring swift justice to anyone who opposes their freedoms. The post Lakeland honors victims of Pittsburgh synagogue shooting appeared first on the Southern.